The iconic VAIO PC brand has been resurrected today, following Sony’s sale of the struggling business to investment fund Japan Industrial Partners. At the time, Sony said it planned to concentrate on smartphones and tablets due to the PC market’s plunging fortunes. 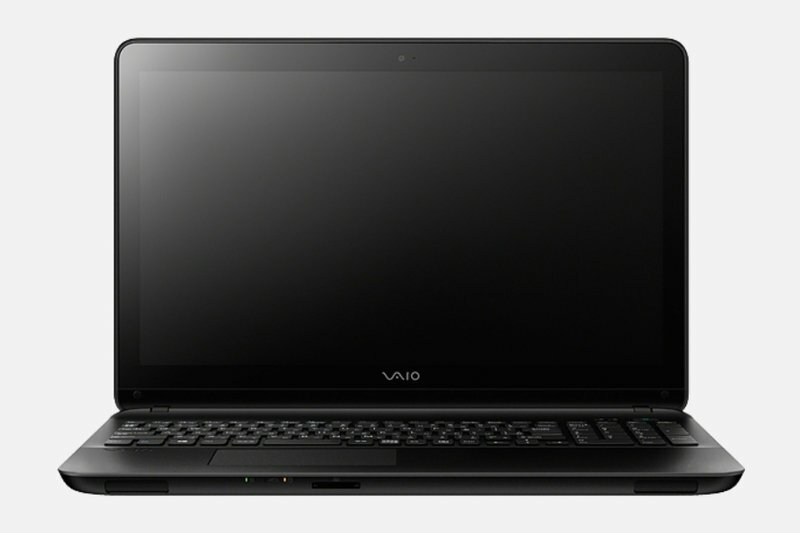 The deal was set to close in July, and now the new VAIO Corporation is selling the VAIO Fit and VAIO Pro computers in Japan. The PCs come without Sony branding, but at least for now are being offered at Sony’s own online store. Today there is a new open standard for real-time communications, and it has the potential to change the way we connect with businesses as email once did. WebRTC, an API definition authored by Google and now being drafted by the World Wide Web Consortium, allows for plugin-free, peer-to-peer audio, video, and data transfer between browsers. For the non-technical, let’s walk through a use case: Last week, you ordered a shiny new tablet from an online store, and you open the box to find the screen is cracked! You DO NOT reach for your cell phone, dig for the customer support number on the website, dial it, wait in a phone tree for 30 minutes, answer verification questions along the way, reach an agent, give her your order number, then laboriously describe the crack in your screen. Instead, you log in to your electronics store account and click on a “Problem with My Order” button. Right there in your browser, you are quickly connected by video call with a support agent who greets you by name. Because you were logged in to your account when you clicked to call, she knows you are a long-time customer and the exact SKU of the tablet that was shipped to you. What’s more, you lift up the tablet and show her the crack on the video call. In a matter of minutes, she has ordered you a replacement tablet. WebRTC makes these superior communications experiences possible. Why are they superior? Context. When you initiate communications via WebRTC (as simple as clicking a button), the data associated with who you are and what you’re doing — your context — can be delivered right along with the call. The call can then be routed to the right person who is equipped with the right information to help. In a world of millions of applications to help us manage our lives, context-based communications seems like a logical improvement for any business and consumer. Why not start communicating right in the apps that we’re using, rather than exiting to make a call on the siloed phone network where your context, other than your caller ID, is lost? There are financial drivers at play here too. With more efficient customer interactions and more data, businesses can optimize staffing and calling automation. But even further, businesses that leverage WebRTC in their applications can save on their phone bills and telephony system infrastructure. So far, there are just a few examples of business applications that have leveraged WebRTC. The most well-known is perhaps Amazon’s MayDay. Smaller organizations in a variety of verticals are benefiting as well. For example, Dobin Law Group in Florida recently implemented a WebRTC-based video calling solution on its website, enabling prospective clients to speak to a lawyer face-to-face with just one click. In addition to the richer calling experience, WebRTC also provides cost savings for both the firm and their clients, who can click-to-call long distance, even internationally, without racking up a phone bill. In the nonprofit space in Seattle, The School of Life Project is providing a video journal kiosk for kids and teens through WebRTC by Blacc Spot Media. The project captures children’s views of themselves and their world annually as they grow, resulting in a healthier sense of self-awareness, identification with peers, and empowerment. An Alabama-based company, RFMS, has leveraged WebRTC for seamless customer support. RFMS is a business management software provider to the floor covering industry. When the company added one-click call support to its help desk portal, it noticed improved customer satisfaction and is considering further WebRTC implementations. WebRTC is also solving other problems, such as streaming from a device to a TV with Google’s Chromecast. But overall, WebRTC is still untapped. Let’s hope this open standard continues to proliferate so we can connect faster and get right down to business. Rob Wolpov is a cofounder of OnSIP, which provides real-time communications services to over 25,000 businesses. Prior to OnSIP, Rob worked as a management consultant at IBM and a VP at LivePerson. 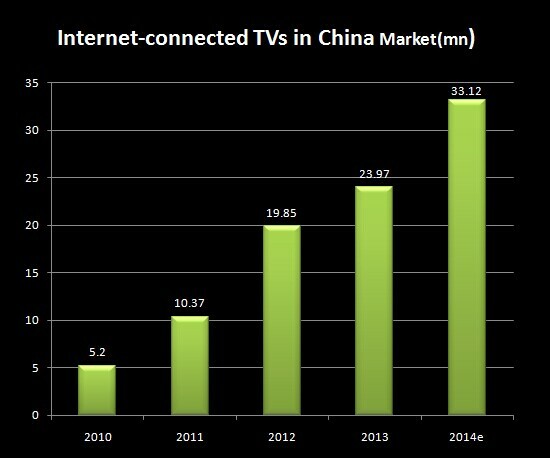 In 2013, 23.97 million Internet-connected TV sets were sold in China, according to the latest report released by Chinese research firm iResearch. The Internet-connected TV sets include both smart TVs installed with an operating system and traditional TVs that can get connected to Internet-enabled devices and display the contents from those devices. iResearch estimates that Internet-enabled TVs as a percentage will continue to grow as the household broadband penetration rate is increasing and device makers are heavily promoting their products. The competition in the smart TV market has been driving down prices. LeTV, currently the leading smart TV and online video provider, now sells a smart TV model at a price less than 1000 yuan (about $160). However, it’s not that Chinese users can enjoy whatever is available on their PCs or other connected devices on their smart TVs or through set-top boxes. SARFT, the Chinese state administration for film, television, and other content only allows seven enterprises to provide videos for set-top boxes or smart TVs. None of the seven is as popular as video sites such as Youku-tudou, iQiyi, and LeTV. Last week, the SARFT issued a notice asking set-top boxes such as Alibaba’s Tmall Box to stop providing those popular video services. A couple of days later, the SARFT launched an operating system for smart TV. It’s unknown whether it will require all the smart TV makers to adopt it. It is believed the operating system cannot be as well developed as those by experienced Internet companies such as Xiaomi and LeTV. Yahoo’s burgeoning online video service, Yahoo Screen, is getting a hot piece of content from HBO today that should draw attention. The first episode of TV network’s much-anticipated new drama, The Leftovers, became available for viewing on Yahoo today, and will stay online through July 6. The new series debuted Sunday night, and HBO is hoping to generate some buzz through Yahoo. Although, Yahoo doesn’t have an exclusive on it. The premiere episode is also now available on the websites of various cable company websites during the sampling period. Created by Damon Lindelof of Lost fame, The Leftovers is a family drama about people who remain on earth after two percent of the Earth’s population suddenly disappear. Also today, Community creator Dan Harmon announced that the former NBC series would be getting a sixth season on Yahoo Screen following NBC’s cancellation of the show earlier this year. Yahoo has been busy signing content deals over the past year to try to make itself look like a real video site. It has an exclusive agreement to offer Saturday Night Live clips, it hired Katie Couric, and even launched or produced a handful of original web series. Yahoo is also rumored to be launching its own streaming video service that would compete directly with YouTube. Well, it was about time: You can finally search downloaded music on Spotify’s iOS apps while offline. While not a seemingly huge update, anything adding to the mobile experience is a win when it comes to Spotify. Rumors that the company was finally making music streaming available on mobile to its free listeners surfaced this past December, and it finally overhauled its Windows phone app in May. Interestingly, it looks like the feature was part of the iOS app until Spotify pulled it back in December, according to a Spotify community thread. The return of more mobile features and capabilities for nonpaying users is likely welcome news to those listeners. Rdio, a similar service to Spotify, only offers offline search on mobile for its paying customers. The seemingly never-ending HP-Autonomy saga took another turn Monday night when Hewlett-Packard ( s hpq)and two law firms representing shareholder groups agreed to settle their differences, meaning they can now work together to pursue legal action against former Autonomy CEO Mike Lynch (pictured below) and CFO Shushovan Hussain. To recap this tortuous tale, HP under then CEO Leo Apotheker, agreed to buy Autonomy in 2011 for more than $11 billion in a deal that was controversial even before it was formally announced — news of it leaked in advance. Apotheker left the company within a year and his successor Meg Whitman alleged in November 2012 that Autonomy — including Lynch — misrepresented the size of its business and engaged in bad accounting practices — essentially duping HP into overpaying. HP also pushed U.K. and U.S. authorities to investigate Autonomy for fraud. The shareholder groups in turn then charged that HP management, including Whitman, didn’t perform due diligence in ferreting out Autonomy’s problems earlier than it did. The agreement hammered out in mediation means that the plaintiffs and their law firms, Cotchett, Pitre & McCarthy and Robbins Geller Rudman & Dowd, will now help HP bring claims against Lynch, Hussain and potentially others. And, in a positive bit of news for HP, all claims against its current and former directors — “other than legacy Autonomy officials and advisors” — will be dismissed. “In recognition of the substantial benefits conferred upon HP, HP, by and through its Independent Committee, has entered into an engagement letter with the Settling Plaintiffs’ Counsel that provides for a fixed fee and fee contingent upon the amount recovered by HP. More particularly, in addition to a fixed monthly retainer in the amount of $562,500 for 32 months, Settling Plaintiffs’ Counsel will be eligible to receive a contingent fee equal to 10% of the amount recovered by HP up to $100 million, and 25% of any amount in excess of $100 million, up to a maximum contingent amount of $30 million. Lynch has repeatedly denied allegations of wrongdoing. In addition, HP agreed to adopt better policies for vetting potential mergers and acquisitions. News of these settle ment talks surfaced in a Reuters report on Friday. This story was updated at 8:28 p.m. PST with details on how the plaintiffs and their attorneys stand to benefit from this deal. Yodlee, a company with cloud-based financial-services software for banks and other finance companies, began the process of going public today. The company aims to raise $75 million in an initial public offering, according to the S-1 document Yodlee filed today with the U.S. Securities and Exchange Commission. The company will be the latest cloud software company to head for public markets. Veeva Software and Tableau had successful IPOs last year, and this year has business-to-business companies like Arista, oPower and Paycom have gone public. Companies like Dropbox, Box, New Relic, AppDynamics, and Cloudera have been in a position to go public this year, although some have taken on financing rounds that could help them put off such an event. Yodlee claims 750 organizations use its tools — including most of the 15 largest banks in the United States — and pass them on to their consumers. The company collects subscription fees for 15.7 million of consumers. At one point, Yodlee served up data for Mint before Intuit bought Mint. Last year Yodlee launched Active Commerce Exchange, a bevy of applications that banks can plug in. With the exception of 2010, Yodlee has taken a loss every year since it started in 1999. Last year Yodlee reported a $1.18 million net loss on $70.1 million in revenue. Most of the revenue came from subscriptions and support, although some also came from professional services. Yodlee, based in Redwood City, Calif., had 780 full-time employees as of March 31. Most are based in Bangalore, India. Investors include Accel Partners, Institutional Venture Partners, and Warburg Pincus. 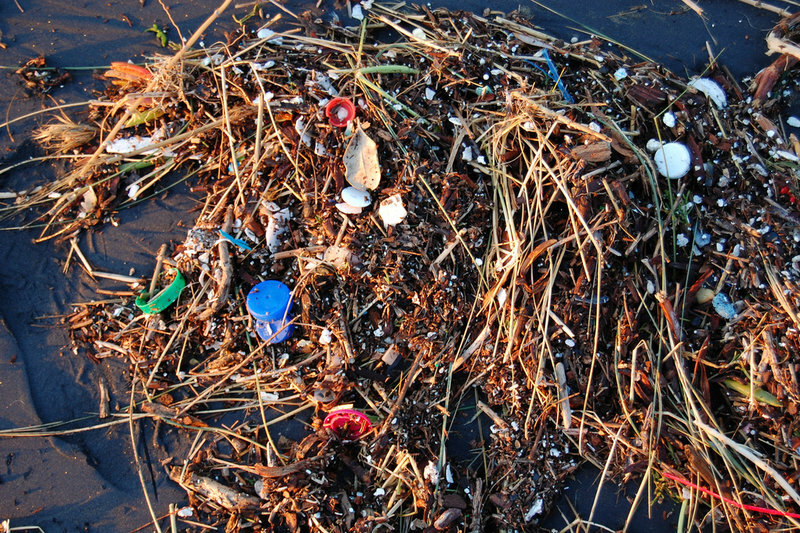 For a decade or more, scientists have assumed our seas carry millions of tons of plastic, much of which should be floating in open water, forming vast midocean “gyres” — islands of man-made mess such as the Great Pacific Garbage Patch. But according to a new study, something more worrying is happening to 99 percent of the ocean’s plastic: it’s disappearing. The idea that virtually no live and local TV is available on the web suggests a sector that’s ripe for disruption. Aereo was to be that disruptor, but the Supreme Court cut it down in its prime last week. FilmOn is an online TV and movie service, but the company has now announced that it’s going to be a virtual cable company that also offers live and local TV over the Web. The company says it will (legally) deliver a paid TV package in 18 cities that includes programming from broadcast channels like ABC, NBC, CBS and Fox. The service will stream to phones and tablets, too. The service is the creation of Nigeria-born Greek billionaire Alki David, who has challenged broadcasters in court numerous times to win the right to license and stream broadcast TV. FilmOn’s alleged secret is something it calls “Teleporter.” FilmOn claims that Teleporter enables a person in one city to watch programming broadcast in another city via a “splitscreen” or a “mini-computer” attached to a thousand-mile long cord. Wait. What?!? This technology probably exists in word only — words chosen to fit neatly through a legal loophole. Where Aereo just captured and streamed the content of TV programmers, David is offering to pay for the content. He has done this numerous times before, but broadcasters have always turned him down. But when the Supreme Court effectively shut down Aereo last week, it gave the opinion that steaming services like Aereo should be treated like cable companies. So David now says his company is a cable company, and he believes the court’s language also means that TV broadcasters are now obliged to sell their programming to FilmOn for a fair loyalty rate. Some legal observers are already saying David is just headed for another court appearance versus the broadcasters, where he will lose. Actually, it’s not quite clear if David is an entrepreneur or an activist — or just a rich wacko. MonkeyParking founder Paolo Dobrowolny will soon board a flight from Rome to San Francisco to take on city hall. When he lands at San Francisco International Airport, Dobrowolny, the baby-faced cofounder of the app whose controversy has engulfed gentrification-sensitive San Francisco, will begin to launch his counterattack against the ambitious city attorney Dennis Herrera, who deemed MonkeyParking illegal and threatened to sue if the firm doesn’t remove the iOS app from the App Store by July 20. Dobrowolny has lawyered up and vows to fight. “I want to work with the city, but I will not take the app down,” Dobrowolny told VentureBeat on Monday. Dobrowolny admits that what started out as the development of an app to address the headache of parking in Rome and San Francisco has turned into a firestorm, with journalists calling him round the clock at his flat in Italy’s capital. He has received hundreds of email, too, both from supporters and those who hate him. The story, as they say, has gone viral. “I am worried about the angry people. So many people are angry out there. I don’t even think they know how the app works,” he said. Dobrowolny sighed and regained his composure. More than anything, the 29-year-old programmer and his two colleagues that comprise MonkeyParking want to explain themselves to a skeptical public, and, as they say, set the record straight. Indeed, Dobrowolny heatedly denied that his app auctioned off pubic parking spaces on public streets. MonkeyParking is all about exchanging information, he said. He doesn’t sell anything, he added. “Hopefully, we will provide a picture of how it works. It’s hard to explain what is really happening to MonkeyParking,” he said. Herrera sent MonkeyParking a cease-and-desist letter last week, demanding that the company remove the app or face a lawsuit. Dobrowolny, for his part, said Herrera is misinformed. MonkeyParking has drivers leaving a public parking space on city streets and holding it for others, Dobrowolny said. If they do, they’ll reap a cash reward. Geolocation features help drivers vector in on the parking spaces they crave. Open parking spaces get monkey-face icons in the app. On the other hand, the outcry from the American press has created an ideal marketing opportunity for the young Italian, who said he’s confident the MonkeyParking app will be a home run. In 2010, Google revealed that the cars collecting location information for its Street View service were also slurping personal data from unsecured WiFi networks as the vehicles drove through residential neighborhoods. Google soon after apologized and explained that the data had been destroyed, but the company continues to face a nagging lawsuit over whether the cars’ activities violated the Wiretap Act, which forbids intercepting a person’s communications without their consent. On Monday, the Supreme Court refused to hear Google’s petition that the lawsuit should be thrown out on the grounds that the WiFi information was available to the general public. The refusal means the case will return to a lower court where a judge will determine if the case should qualify to be heard as a class action. The case drew widespread attention because it involved one of Google’s more notable privacy stumbles, and because the incident helped to define how the Wiretap Act — which was originally written to address telephone calls — should apply to communications in the digital age. In the case of the Street View cars, the vehicles were able to get information not only about the name and location of the WiFi network itself (like the one you have in your house) but also, in the case of unsecured networks, the “payload” data traveling across that network, including emails and passwords. Today, it’s unlikely that Google would be able to obtain much information this way, even if it tried, since most people now secure their WiFi network with a password, which makes it largely secure from passersby (or Google cars). Now that Google has failed to win a motion to dismiss at the Supreme Court, the original judge will now determine if the 2010 incident should be certified as a class action. Google may also choose to settle the case instead. About a year ago, Sun Microsystems cofounder Scott McNealy could see that his Denver-based startup Wayin needed to change its focus. The company had built a social networking site where people could participate in social polls about everything from sports to elections to the latest episode of Buffy the Vampire Slayer. But as the popularity and staying power of Facebook and Twitter surged, it became clear that people wouldn’t want to go off to some specialized social media site to do social polls. So Wayin began to develop polls and other social activities that could work on top of Facebook and Twitter. Ultimately, Wayin pulled the plug on its own social polling site to focus all of its efforts on building “social hubs” for clients. McNealy, who acts as the chairman of the company’s board of directors, says it wasn’t really a pivot so much as it was a focusing on one core business model. “We had enough money so we were able to experiment, and we found out that the Wayin hub model was the one that showed the most market potential and the best chance to make money,” McNealy told VentureBeat. With the new focus came a new CEO. McNealy brought in Elaine Wood, a former Sun executive who has lots of experience selling services to large enterprises. The company also had to do some “rightsizing” with the staff to get the right skill sets in place to build social media hubs for large brands. “We put all of the wood behind one arrow to focus on what was most critical,” McNealy says. For example, Wayin helped the NFL’s Denver Broncos create a social engagement hub where fans can see tweets, images, and videos from other fans, players, or the team. The social hub also helps the Broncos to better understand what kinds of material resonates best with fans, whether it’s scores and stats or individual player updates. The Broncos can then use a dashboard to search through social content using key terms, Twitter handles, and hashtags, then display the best content on the screens in its stadium at Mile High. Wayin helps brands, sports organizations, and broadcasters aggregate, display and analyze social conversations from Facebook, Twitter, Vine, and Instagram. The company’s clients can create unique displays featuring polls, videos, trending topics, heat maps, counters, and general aggregated content around an event, topic, or hashtag. The social hubs access data from Wayin’s social aggregation platform. Wayin is one of the few companies that has access to the “Twitter firehose,” meaning that it can work with every one of the billions of tweets published on Twitter every day in real time. The company also has access to a similar information flow from Facebook and access to images on Instagram as well as to videos from Vine and YouTube. Wayin’s clients buy access to Wayin’s social media aggregation platform on a subscriptions. They can then buy creative products that display social media content (like polls, statistics, or selected tweets) to post at their websites, mobile sites, or, in some cases, on TV. Social media stats can be presented in charts and graphs, or in heat maps that show where (geotagged) tweets on a certain subject are coming from. Through its acquisition of Comenta TV last year, Wayin can now enable television networks to post the results of social polls and relevant posts and tweets about the programming being shown. For another of Wayin’s clients, The Weather Channel, the company might use geotag filtering to find tweets originating from very near a major weather event like a tornado. These tweets can be shown live on the Weather Channel to create a sense of immediacy in the programming. Wayin can also track a certain subject on social networks and then enable its clients to choose the most interesting or desirable tweets, posts, images or videos, and post them at their sites. The Broncos might pick out interesting tweets about a game and post them on the scoreboard during the game. Wayin is unique among social marketing companies because of its mix of social aggregation and creative services offerings. It competes with Gnip (now owned by Twitter) on the aggregation side, and with Conspiracy Media Group and Resolution Media on the creative services side. McNealy believes that social advertising will continue to take a larger and larger piece of companies’ ad spends. “It’s moving mobile and it’s moving toward real-time,” McNealy says. “We call it hindsight, insight, and foresight. In the old days you’d run an ad and then come back at the end of the year and trying to see if it made a difference, so that’s hindsight. 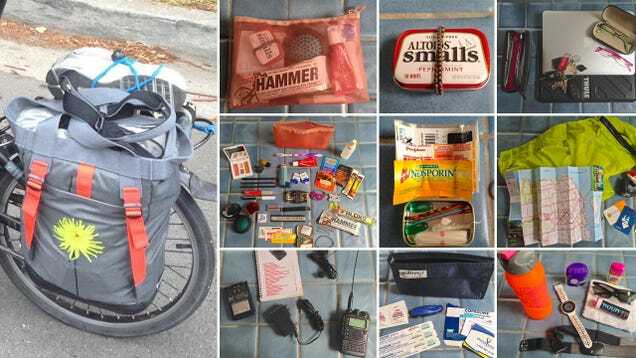 Commuting on a bike is awesome, but you do get stuck stuffing everything you need for an entire day into a single bag. Linguist Laura Welcher shares how she does it with Cool Tools.